Call me crazy, but I don’t like sweet potato casserole. Loved the stuff as a kid, but for some reason now I find sweet potatoes loaded with a sugary marshmallow topping to be somewhat repulsive. Marshmallows, the beloved heart of my favorite toasted campfire treat, repulsive? Yeah, my ten-year-old self would’ve thought that was an unthinkable union of words too. Though I still love the ooey gooey fluff, my growing taste buds have chosen to no longer accept it in every single possible one of its manifestations. Now, come Thanksgiving and Christmas, I actually find marshmallow to be a destructive ingredient, ruining something that’s already so naturally sweet and delicious. Regardless, sweet potato casserole will be on our table every winter holiday, no matter what side of the family that we are sharing our celebrations with. There’s something about tradition that sticks. Generally, a small spoonful will land on my plate too because my little kid self forgets that I don’t really enjoy that marshmallow tradition anymore. What I do love, however, is our relatively recent tradition of bringing a huge dish of roasted root/winter vegetables every year. Largely unadulterated and naturally sweetened with a simple caramelization in the oven, this it the way I now crave my root vegetables. It’s refreshing to have something on the table that’s as simple and colorful as a simple array of roasted winter veggies. I find myself making a variation of this dish all winter long to serve alongside protein-centered entrees. However, it’s only on special occasions like holidays where I’ll get it together to combine 5 or more different types of winter vegetables. 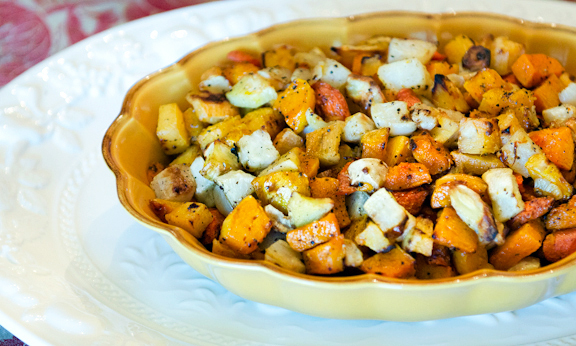 These are the best potpourris of roasted winter vegetables and certainly make these simply prepared veggies capable of shining among all the other casseroles on the table. Preheat oven to 400F. Line two large baking sheets with aluminum foil or parchment paper. Toss vegetables, excluding the garlic, with olive oil to lightly coat. Generously sprinkle with salt and pepper. Bake for 15 minutes. Add garlic, and stir all of the vegetables on the pan. Bake another 15 minutes. Stir contents of pan. Return to oven another 10-15 minutes, if needed, until all of the vegetables are fork tender. Serve. I went to a family reunion for my mom’s side of the family last week, and they are from southern Ohio. Needless to say, there is never a healthy option, other than the one my mom and I bring! This year I actually didn’t bring anything, but my mom brought roasted root veggies; carrots, parsnips, and some random cauliflower. They were simple, yet so delicious. I had never thought of adding rutabaga. I don’t think I’ve ever cooked with turnips or rutabaga. Can’t wait to try it! We like sweet potatoes sliced 1/4″ – 1/2″ thick, microwaved or steamed, and served drizzled with Asian sauce and sprinkled with goma, a grinder of coarse sea salt and sesame seeds. Looks great! Roasting seems to bring out the sweetness in root vegetables, which are cheap and plentiful at this time of year. This type of dish is my go-to all winter long! I definitely know where you’re coming from regarding the sweet potato casserole. I too find it absolutely repulsive! I’m going to make roasted root vegetables tonight and am now wishing I had bought rutabaga when I was at the store yesterday!